Popular software development culture advises us that 100% test coverage of our code is no reason for pride. It's not even a goal to be pursued on high priority. Either taught by our experience already, or we've overheard at least an elder (developer) say say it before: having test that provide complete code coverage does necessarily mean that our code is good, less so that it is correct. Tests written after more tests don't always grant us confidence. If you're a veteran in the field, and you've already reached this paragraph, maybe it's time to hop back on HN for something more worth your time. This one is for the novice, for the apprentice, that five minutes ago would have felt intimidated to hear about a "code coverage analysis tool". 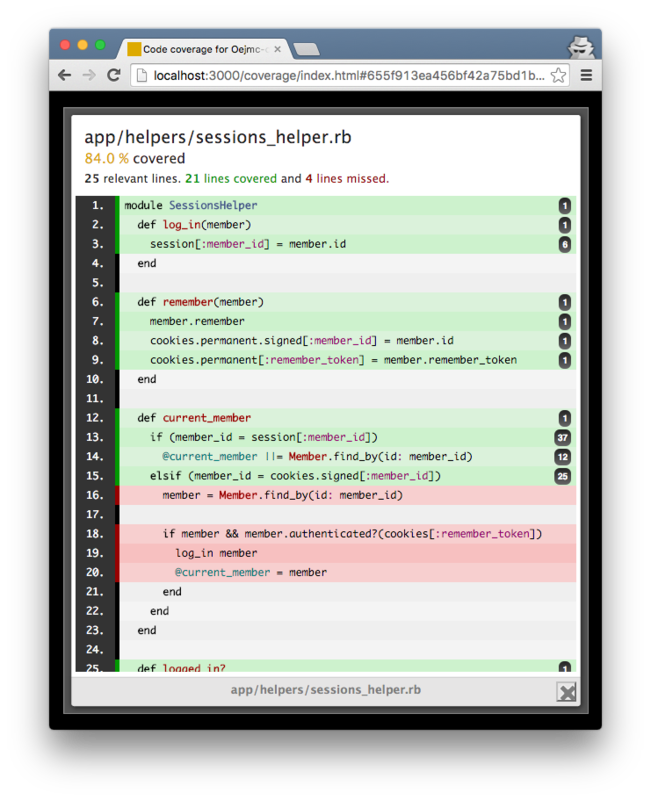 The RailsTutorial.org is one of the resources I sometimes mention when asked about a handy, structured way to get up to speed with Rails, with some Ruby, even with basic idioms of developing for the web. It's a nice, gradual intro aimed to best serve the novice. Oftentimes, Michael Hartl leverages footnotes and asides to open doors and inspire the reader to explore further. Some other times though, it's easy to still find opportunities for improvement. […] we verified by hand that the persistent session implemented in the preceding sections is working, but in fact the relevant branch in the current_user method is currently completely untested. 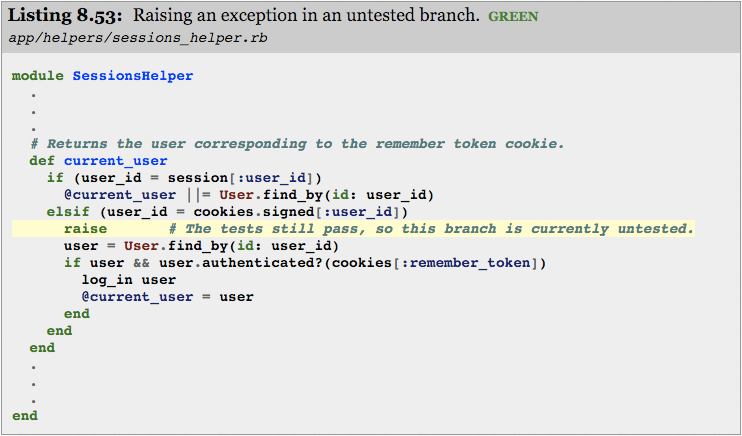 My favorite way to handle this kind of situation is to raise an exception in the suspected untested block of code: if the code isn't covered, the tests will still pass; if it is covered, the resulting error will identify the relevant test. Keeping a beginner mindset, one is expected to understand all the complete paths that their tests are currently covering. Only then can we start to speculate on the quick wins of raising an exception. Hey, time for a quick time travel: how many of us can be proud about the design and the simplicity of our first Rails app? Was it really that simple to fully grasp it on the first take? This is where I believe a code coverage analysis tool shines: in its simplicity and ease of use, relative to the amount of insight provided. We all strive to increase the number of feedback loops that we can leverage. And the quicker, shorter those loops are, the better. So when it comes to static code analysis and code metrics for Ruby, SimpleCov is probably one of the most used tools, next to RuboCop and others. Why… wait; how do I use SimpleCov? OK, let's open up our Rails project in your favourite text editor. Time to launch SimpleCov. The official docs suggest to do it within the test/test_helper.rb as well, but why not keep it clean if we have the option? Even if we are not using SimpleCov to merge multiple test suite results (i.e. MiniTest and Cucumber), we can still leverage the .simplecov centralized config file, that we create in the root of the project. 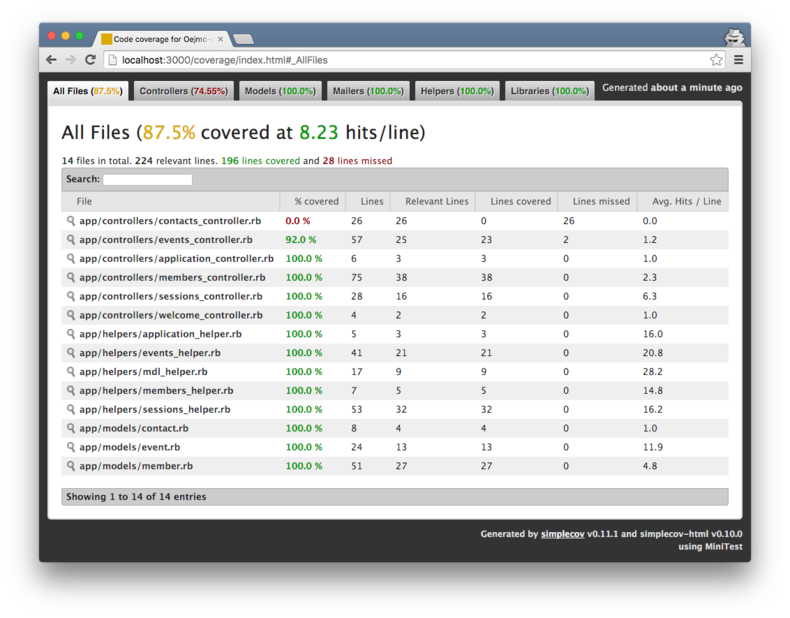 All that's left now is to run our tests, specifying when we'd like our code coverage analyzed. To make it easy for ourselves to undestand what we've missed so far. To be aware of our possible blind spots. 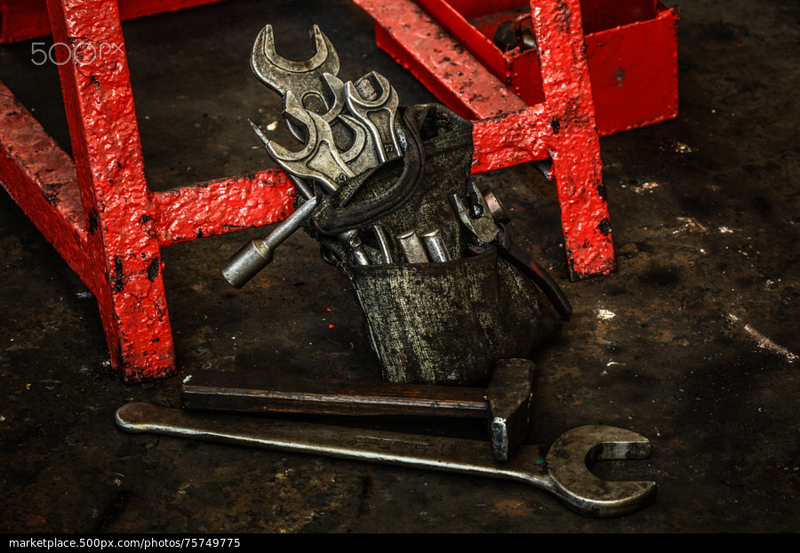 Now, this is just one tool, and for just one purpose. What are your favourite gems or services that you use to collect code metrics?